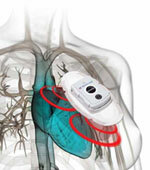 The Holter monitor, invented by Dr. Norman Holter, is a device that records the heart rhythm continuously for 24 hours. This means that it records each and every heart beat over that time period. Sticky patches (electrodes) on the chest are connected to wires from the Holter monitor. The monitor is carried with the patient for the recording period, usually 24 hours. 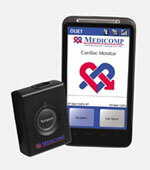 The heart rhythm is recorded onto a cassette tape or flash card technology and then processed at a heart center. From this recording, a wide variety of information can be obtained, including heart rates during day and night, abnormal heart beats, and changes in heart rhythm during any symptoms. A diary comes with the Holter for the patient or caregiver to write down the time and type of symptoms felt so the rhythm can be reviewed. Figure 1. shows Holter monitor with four leads and solid state recording. Other monitors may have up to seven leads and run on cassette tapes.